This page provides two charts that plot the quality ranks of Detroit's Big Three and 5 Japan-based automobile manufacturers - General Motors Corporation, Ford Motor Company, Chrysler Group, Toyota Motor Corporation, Honda Motor Company, Nissan Motor Company, Fuji Heavy Industries Ltd. (maker of the Subaru), and Mazda Motor Corporation. Each chart employs a different method for computing the quality rank of the manufacturers. The first graph provides the ranks of the above 8 car makers based on each manufacturer's infrequency of trouble-prone models. These ranks provide a measure of how well each manufacturer's models successfully avoided the bottom end of the model-quality spectrum for the years 1980, 1985, 1990, 1995, 2000, 2005, and 2010. 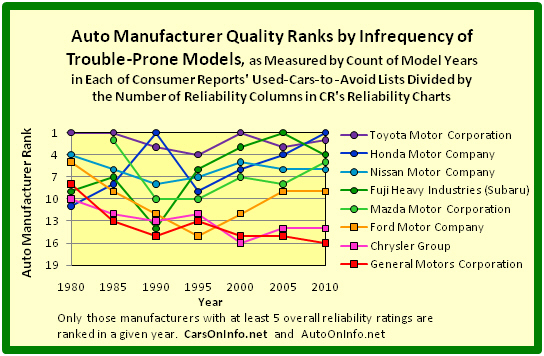 The second graph provides the ranks of the above 8 car makers based on the average of the overall reliability ratings of each manufacturer's models. The second ranking provides a measure of how well a manufacturer's models performed over the entire model-quality spectrum in each of the years 1975, 1980, 1985, 1990, 1995, 2000, 2005, and 2010. 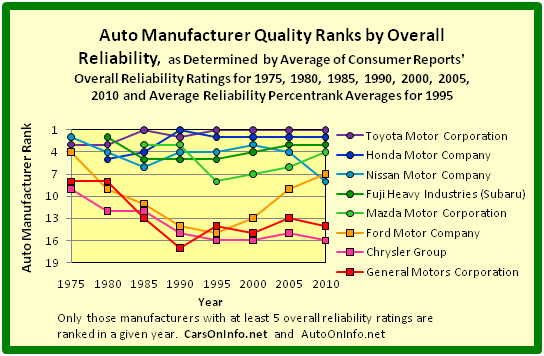 The quality ranks of the above eight automobile manufacturers by these computations are given for each of the above years in the first graph below. The quality ranks of the above eight car manufacturers by this set of computations are given in the second graph below. 1. By the quality ranking based on the infrequency of trouble-prone models, Detroit's Big Three were scattered among the Japan-based manufacturers in 1980, but in 1995, 2000, 2005, and 2010 all of Detroit's Big Three fell below Toyota Motor Corporation, Honda Motor Company, Nissan Motor Company, Fuji Heavy Industries Ltd., and Mazda Motor Corporation. 2. By the quality measure based on overall reliability, Ford Motor Company alone has approached the quality ranks of the Japan-based automobile manufacturers, and only in the years 1975 and 2010. 3. By both quality measures, General Motors Corporation and the Chrysler Group appear to be vying for worse product quality. 4. By both quality measures, Ford Motor Company's quality rank plunged until the early 1990s, but since then has nearly recovered to what it was in earlier years. 5. By both quality measures, GM's and the Chrysler Group's quality ranks plunged until the mid-1990s and have remained at about those levels. 6. By both quality measures, in 2010 Ford ranks much higher than GM and Chrysler, but lower than 4 of the 5 Japan-based auto makers.